ClickFunnels is an online sales funnel builder that makes it easy to build targeted web pages to capture leads and convert audiences into paying customers for your online business. Is ClickFunnels Right For You? If you’re already ready to buy, skip to the end of this review and grab my $17,772 ClickFunnels Bonus Package. Are you an online entrepreneur? Or maybe you’re looking to become one. Well, my first ClickFunnels experience was at the 10X Growth Conference hosted by Grant Cardone in Las Vegas earlier this year. After seeing Russell Brunson’s infamous “3 million dollars in 90 mins” presentation of his sales funnel software I was hooked. I decided to sign up for the full 12-month ClickFunnel subscription, planning to use it to its fullest. And throughout the course of the year I’ve done just that. I’ve built dozens of sales funnels in multiple niche’s. 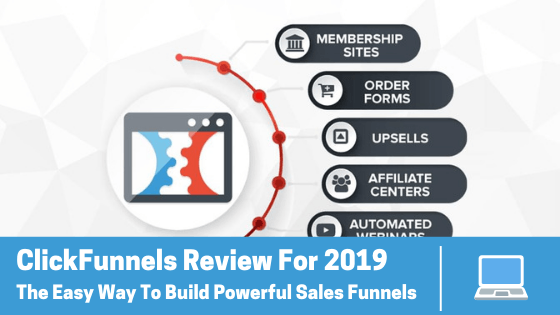 So..since I’ve been using the sales funnel builder for quite some time, I figured I’d give my honest ClickFunnels Review for 2019. 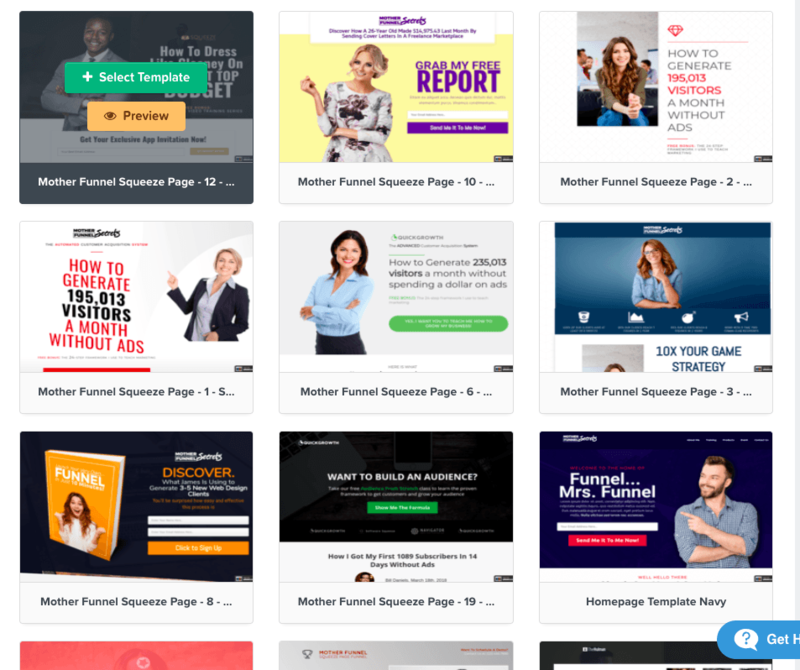 In this review, I take a detailed look at the sales funnel platform known as ClickFunnels – what it does, how it works, the pros and cons, and how it compares with its competition. In order to give a complete ClickFunnels review and really illustrate the value of the product, I need to first explain what a sales funnel is. A sales funnel is simply a guided path that prospects move through in your sales process, encouraging them to become paying customers. The whole point of creating a sales funnel is to get a potential customer’s email. Think of getting an email like getting a future spouse’s phone number. You eventually want a relationship (sale) but you need to start from step one. Getting someone’s email doesn’t mean you will make a sale – but it does increase your chances! ClickFunnels is an online sales funnel builder. It makes it easy to build targeted web pages to capture leads and convert audiences into paying customers for your online business. 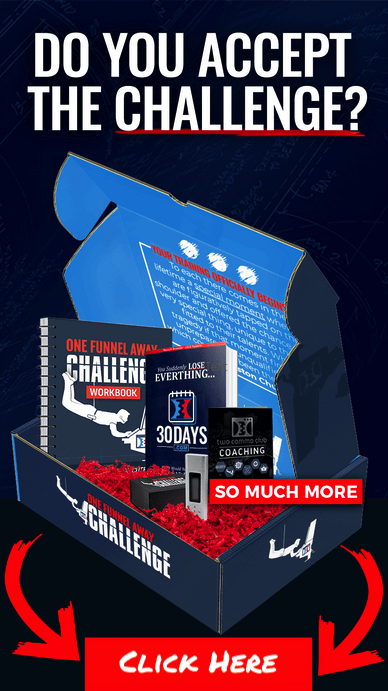 It’s a powerful tool built specifically for entrepreneurs who want to succeed online. In the past, you’d have to have a website, hosting provider, an autoresponder service, landing page software, split-testing software, membership software, a programmer and probably a little photoshop knowledge to put everything together. This not only saves you a ton of money in buying all those different products and services but it also saves you the time and headache of trying to make those tools work together. 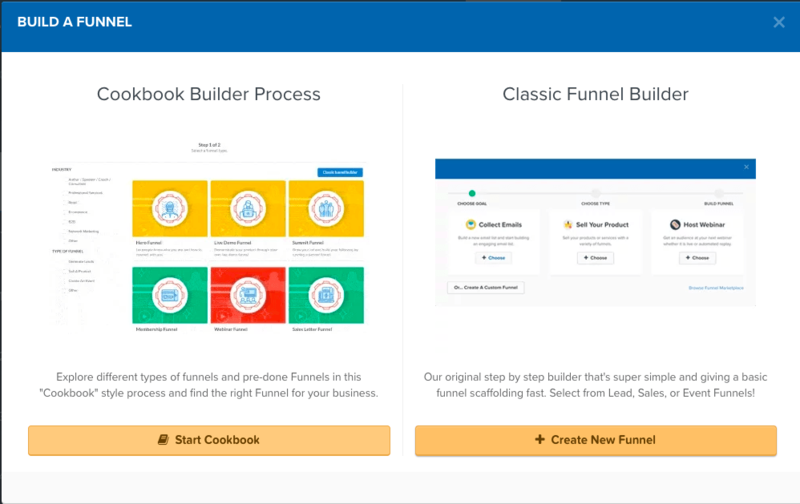 ClickFunnels has all the code you need to build a functioning funnel in under an hour. So you don’t have to mess around with any complex HTML or settings to do it. You simply select a funnel type and follow the steps ClickFunnels provides to create your funnel. ClickFunnels is a unique tool designed to make the task of building sales funnels extremely fast and easy. It can create landing pages, sales funnels, upsells, downsells and create membership sites very easily. Say for example you provide Local SEO services and you do one-on-one business consulting and offer business packages. With ClickFunnels you can send traffic to your landing (aka sales) page and get people to opt-in your your email list. Once they have done that, they are given the option to buy your services or get a free e-book to help them improve their local presence. If they buy the service they are then given an additional page to get one-on-one consulting from you. All of this can be done directly on ClickFunnels without having a website or paying for any additional software. ClickFunnels also comes with its own analytics software where you can see how successful each funnel step is. It also allows you to A/B test your funnel pages very easily so you can optimize your pages for the most sales or leads. ClickFunnels offers a 14-day free trial with no credit card information required. You can do quite a bit during those two weeks if you put in the time and effort to use all of its features to build your funnels. If you use your 14-day free trial to the fullest, I’m sure you’ll realize the value also. Then you can sign up and use it for a few months to see how your new custom sales funnels perform with your audience. At that point you can start to see how ClickFunnels pays for itself! $97/month for the ClickFunnels software, or $297/month for the Etison Suite, which includes ClickFunnels, Actionetics, and Backpack. ClickFunnels comes with an awesome stock of pre-made templates which the add to all the time. They are easy to use and take just minutes to set up. ClickFunnels also has a marketplace where you can buy and sell free or paid templates. But purchasing templates isn’t necessary, there are a huge variety of templates that come built in for free. Anyone who has used any sort of landing page software before will really appreciate ClickFunnels easy drag and drop editor. The days are gone of having to making minor tweaks and constantly relaunching your sales page to make sure the changes look the way you want them to look. With the ClickFunnels editor, any changes you make will look exactly the same when you launch the page. This will seriously save you so much time and a lot of frustration. Elements, also known as widgets in the builder, are what allows you to personalize your sales page. This is another advantageous feature that puts ClickFunnels in a category on its own because it comes stocked with many powerful widgets that other landing page softwares currently do not have. The best place to go to get help is the ClickFunnels Facebook Group community. It’s full of people just like you (new to building sales funnels) as well as veteran entrepreneurs who have made a lot of money using ClickFunnels. Post a question in the Facebook group and within 10 minutes you can usually get an answer. 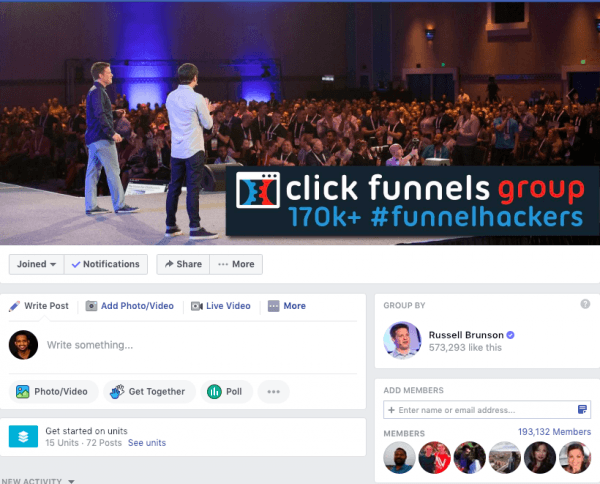 The official ClickFunnels Facebook group has more than 193,000 members. It’s a social learning group aimed at allowing entrepreneurs to help other entrepreneurs. Now this wouldn’t be a complete ClickFunnels review if I didn’t mention their incredible affiliate program. Also, you don’t have to apply to sign up for it. 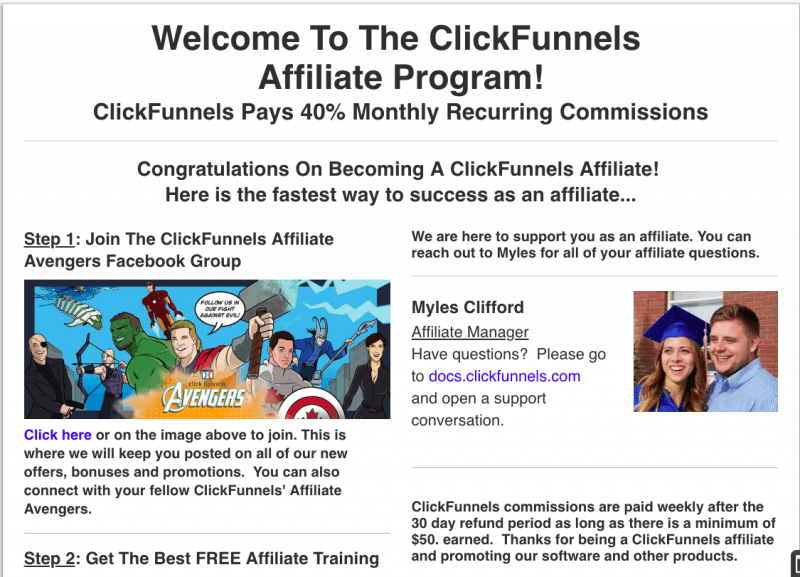 You are automatically a ClickFunnels affiliate as soon as you become a customer. What’s super awesome about their affiliate program is that they offer what is called a recurring commission. That means when someone discovers ClickFunnels through you and signs up, you get a cut from ClickFunnels every time they pay their subscription. So how much is your cut? You earn 40% of their subscription. In the world of affiliate marketing..that is huge! Think about it this way: assume you refer even one person to ClickFunnels and they use the tool for 3 years. 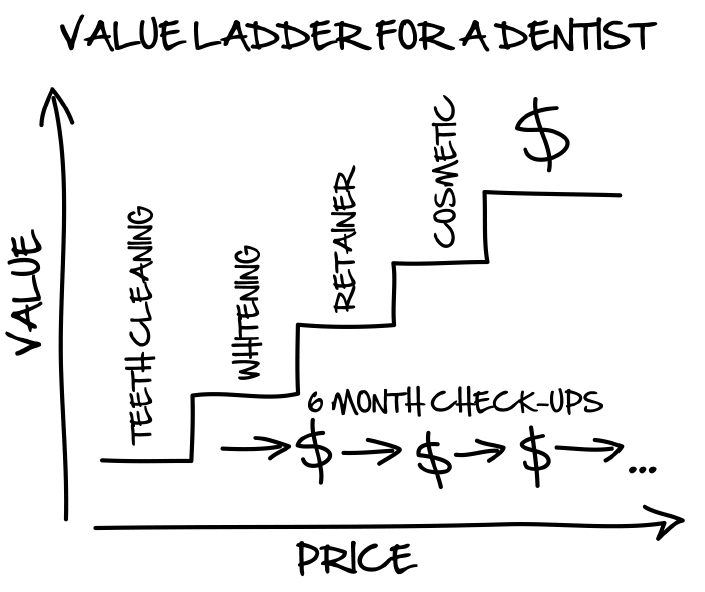 That’s $97 x 40% x 3 years x 12 months each = $1396. With the ClickFunnels affiliate program you can promote various products, not just their main tool. Go to your affiliate dashboard and you’ll see there are links for certifications, books, funnel courses that they sell, etc. It’s very simple to use these links to promote affiliate products by sending them out to your audience. For example, I offer a free course that teaches people sales funnels, how to use ClickFunnels, and everything they need to know to get started. There are no requirements to sign up, it’s just a free course. And I offer it for free because it includes my affiliate links, so I can earn commission when my audience clicks through and starts purchasing ClickFunnel products. Now..not only does ClickFunnels offer 40% recurring commission, they also do a lot to encourage their affiliates to succeed. Such as going way above and beyond any affiliate program I’ve ever seen. Have a look at whatsyourdreamcar.com. It’s a website that ClickFunnels’ founder Russell Brunson set up specifically to incentivize product affiliates. As the name suggests, they will actually buy you a new car if you refer 100 new ClickFunnels users. The best part about the ClickFunnels affiliate program is “sticky cookies”. Sticky Cookies are a piece of code that stays in your web browser for X amount of days. So when someone visits ClickFunnels through your affiliate link and they decide to buy at a later date..you still get the credit. Essentially ClickFunnels gives you commissions on ANY product a customer you refer purchases. For example, say your referral buys the software, then down the road buys their $1,997 course, and even further down the road buys a $2,500 package. You get 40% of everything that referral purchases. And with as many high-quality products as ClickFunnels has, you’re in for some awesome commissions. Did my ClickFunnels review get you interested in taking that free 14-day ClickFunnels trial? By grabbing my bonuses, you will save yourself so much time and provide a ton of extra value with a minimal amount of effort on your part. Take a look at my ClickFunnels bonus page for more details on the above bonuses. Congratulations on making it through my ClickFunnels Review! At this point you pretty much understand why this tool is so valuable for me and my business. If you try ClickFunnels out and take full advantage of its features and opportunities, I’m sure you’ll see what a powerful tool it can be for you as well. If you’re in the market for a sales funnel tool or just another opportunity to make an additional income, then you should seriously give it a chance. There are literally hundreds of online millionaires that credit Russell Brunson and ClickFunnels for their success. ClickFunnels isn’t perfect, but it definitely is the best at what it does..and that’s sales funnels. If you're ready to give it a try then click the button below. Let’s stay in touch! Leave me a comment below and let me know what you think of ClickFunnels. Affiliate Disclaimer: We hope you liked this ClickFunnels review. Please note that some of the links inside this article may be affiliate links to ClickFunnels. That means that if you click on one of the links and sign up, we may be compensated for it. If you do happen to click, we really appreciate it! Any money we make keeps this site running smoothly and allows us to keep writing these high-quality reviews. Secret MLM Hacks Review | Steve Larsen The New MLM Whisperer? I'm an Entrepreneur and military veteran who passionately loves life and loves to EMPOWER others. I show people how to build a business from their living room with nothing more than a computer and an all out passion to win! Copyright © 2019 by Brand The Boss. All Rights Reserved. error: Property Of Brand The Boss! !